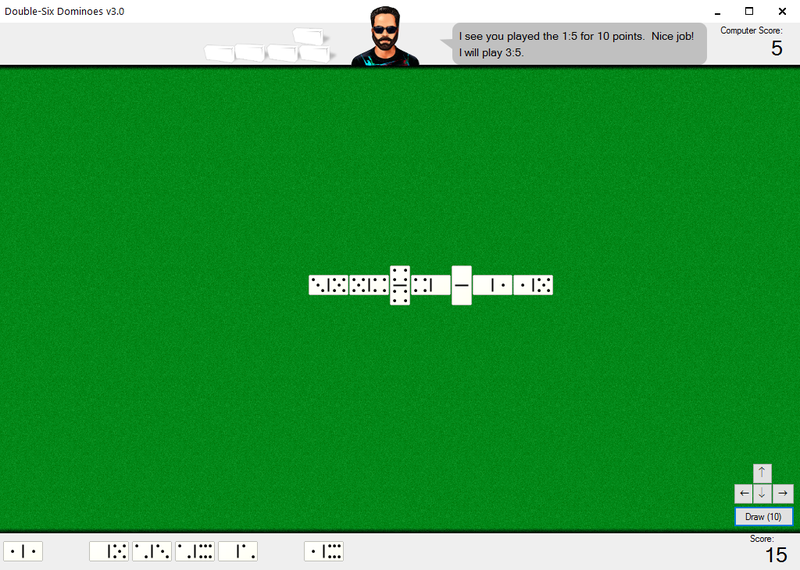 With Double-Six Dominoes, you can play against the computer with 4 different levels of play. Double-Six Dominoes follows the rules known as 'Muggins' or 'The Five Game'. This program is very easy to use and you can customize the look-and-feel and the game rules. Start with Easy mode, then you are ready, switch to Hard mode for a more challenging game. I developed Double-Six Dominoes because I could not find a dominoes game that properly simulated the way that I like to play dominoes. My goal in writing this game was to simulate as closely as possible the experience of playing dominoes. This is the reason that the dominoes that are in your hand are displayed horizontaly. I don't play with my dominoes proped up on their ends! So, neither does this simulation. I also wanted to accurately simulate the way that I play. I developed the computer's AI to be as close to the way that I actually play as I could get. In fact, my record against the computer's Hardest Mode is almost even. It plays a solid game and should provide you with many hours of entertainment. I invite you to download and try this game for free. All that I ask is that if you like it and plan to play it in the future that you donate a few bucks to me. Visit the Donation Page for details on how to send me a donation. I sincerely hope that you have as much fun playing this game as I had writing it! Have a question or comment? Just want to say thanks? How about chatting with other people who just love Double-Six Dominoes? Visit the forums and meet new friends! Double-Six Dominoes version 3.0 is now available for download. File size: 2.31MB. Windows version released Sept. 25, 2015. This is a full-featured unrestricted version.